Superman fades into the Phantom Zone, only to be brought back by Mon-El, who helps him focus himself. Mon-El takes him to a prison in the Phantom Zone, Rozz, that was brought to the Zone when a projector exploded, entombing the prison in the Zone. Zod found the prison, where people are no longer Phantoms and yet still trapped in the Zone, and had Chris while working to create his escape. With Chris as a harbinger, they used his way through to get to Earth. Mon-El tells Superman that Chris has been abused. Superman goes into the prison to explore, but Mon-El warns him about Dev-Em, a Kryptonian mass murderer. Superman goes in anyway. Inside, Dev-Em attacks Superman, who fights back, but ultimately is about to fail. Mon-El smashes an unexpecting Dev-Em and saves Superman, nearly succumbing to lead poisoning (a Daxamite's weakness) before they escape to the Zone again. Ursa taunts Lois Lane, threatening her. Zod backs her down, insisting that he's going to find out why Superman wants Lois above other humans. He moves forward, and Chris hits him with heat vision. Zod moves to discipline the child. Lex Luthor stares at a giant blackboard filled with theories in a lab. 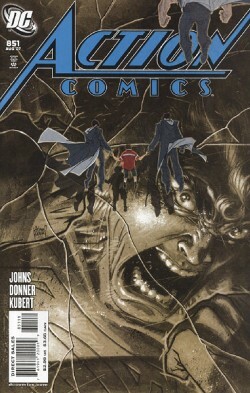 Superman bursts in through a wall, grabbing Luthor and tells him to help stop Zod. Superman is hit with several blasts as Luthor reveals that he won't be teaming up with Superman, rather, Superman will be teaming up with Luthor's new revenge squad, The Parasite, Bizarro, and Metallo. Story - 5: Insert obligatory comment about how a comic should never take seven damned months from the time its last part was released, and how shamefully unprofessional that is: HERE. I won't blame, I'm sick of that. I won't call for heads, because they don't give a crap what I think in that regard, one would imagine. I'll just say that it's a slap in the face to people who pay their bills. The editors caterwauled about it in a recent editorial. "What should we do?" while wringing their hands and saying that we fans are hip to the fill-in jive, ergo they can either delay us or throw us fill-ins. They neglect to indicate that it's a fine idea to just fire Adam Kubert and bring on another artist to finish this series in a timely fashion. Why don't they do that? Why do they think they can't do that? Because comics have become an elitist medium corrupted by a cult of personality. Face it. Beyond Superman, which I read because it's SUPERMAN, the character, I realize more and more that I wouldn't be reading Amazing Spider-Man if it weren't for loyalty to J. Mike Strackszsicsicszinski (Maybe I misspelled that). I stopped reading Wonder Woman when Greg Rucka left, and stopped reading Teen Titans now that Geoff Johns has. I will be giving up JLA soon, as Brad has fallen out of my favor in several ways, when actually, looking back, the story was semi-decent. I'll probably reconsider that. The point I'm making here is that when an industry kowtows, and when its consumers kowtow to the personalities behind the book, the characters and the industries suffer. The editors and publishers would call it (rightly) madness to remove the drawing power of the name from the covers of the books. That's a catch-22 there. You can't remove this cult of personality, and this cult of personality leads artists and writers to believe that they can do things like this. Jim Lee, Adam Kubert, it's the artists, not the writers, for the most part. It started with a momentary cringe at Todd and Rob in the early nineties, and now it's become systemic, and it's driving me away from popular comic books. BUT NEAL, so the masses and the artists would say. "Isn't this a great book? Isn't it great? Doesn't the art pop?" Yeah. But that's also kind of not the point. I know about ten guys personally whose art pops who, if they told their editor they couldn't meet a deadline, would be fired, fired, fired, fired, fired. And that's justified. They're not any better or worse than Adam, but Adam has the cult of personality that allows him to get away with this crap, even if he is slowly being removed from the project. Even Geoff, who's being made to look bad by this whole affair, had to pussyfoot it when he explained to us all what's going on here. If you don't like it, don't buy it, and it's three dollars, not the end of the world, yes. I understand that, and my indignation isn't furor. Nonetheless, this story and its handling is indicating to artists that this will be tolerated, and adding to an industry that already over-indulges the time it takes to take the craft. And don't get me wrong. If John Q Artist has a story that will take him fifteen years to tell, and when it's done it'll be brilliant, and he can only put out an issue a year, by God, enjoy that experience, put it out, and people will buy it. After all, it's gonna be brilliant. But in a systematically monthly medium with a readership expectation of regular media, a systematic monthly medium where lateness is becoming more and more common due to the cult of personality, cut the crap, pull it in, release it on time, or fire the person responsible for the failure. OR, release it as a special when it's done. OR, release it when it's ready. If it's a good story, people will still buy it. Anything else is greed based in the cult of personality. It's probably personal for me. I just can't imagine a single situation where I, as an artist, would be asked to produce X item, and then be given Y date, and not be able to appraise appropriately whether or not I could meet that deadline. And if things got tight, I'd step it up or, realizing I wasn't going fast enough, explain that I should be removed. Though Adam Kubert is great, and though I respect his work both as an artist and as a kind human being who was nice to me, the fact is, his work is replaceable or at very least artwork can be found that will suitably tell the story. When that's not the case, the story didn't come first, the artist did, and that's not very bohemian. Not to me. The story itself continues to rock. Beyond a shaky early/middle period with Lois waffling about having a kid, now things are in full bore fun mode, a true Superman tale to the core. There are some niggling issues my reviewer eye picked up, things that would bother some folks, things that should have been addressed, but they're not enough to overwhelm the story, not by far. This includes the fact that Superman seems baffled and out of control in the Phantom Zone, despite having been there pretty regularly over the years. The "annual" story of Mon-El is retold, making for redundant, if compelling story. This is probably a scheduling/make up for Adam thing, so I'm not as beefed about it, and it was done well, regardless. The story also extrapolates a good bit, telling rather than showing through dialogue, but it manages to come off well, at its worst describing the prison, but still, the subject matter is so compelling that you don't care. The largest issue, and the thing I don't buy at all, is that Lois is only alive so that Zod can find out what she means to Superman. That's really hard to buy, and kinda odd. Rudy, the male Parasite, is magi-back-to-life. New Earth! I like to see him back, but I'd like to be filled in here, particularly with the Green Parasite running around, one would suppose. Otherwise, compelling action, heroic acts by Superman, a truly sad dilemma with Mon-El, and really neat, end-of-the-world vibe action with empty, dusty city streets, Zod in power, and other horrific cattle roundups. The Luthor scene was a win and a loss for me, because while I love Superman bursting in on Luthor, and Luthor being in charge in his brain way, I'm also still at odds with seeing him reduced to a scientist cowering in a pit making plans against Superman as opposed to the much more compelling vision of him being the untouchable businessman, which I much prefer. There's no reason he can't be the businessman and still hovel on a floor making plans. The fall from grace diminishes Luthor's effectiveness as a power, to me. But seeing the Revenge Squad made me squee, so whatever. I don't know what you think, but I can't fault the plot for the story's lateness, so it's still a five. The delay, however, is a solid one, and really, really, really should be addressed industry wide, by our pocketbooks and by those responsible who have had a remarkable dereliction in duty in this regard. Art - 1: I think I'll take it out here. Does the art stink? No. But it deserves a minimal, near-zero rating for making a story like this delayed and forwarding the "artist over art" phenomena in comics. Compelling in every respect, beautifully rendered beyond one panel (Superman's really kind of "meh" when throwing Mon-El out in the close-up), and epic beyond epic, this art should be a five all the way. Instead it's a one, because it took seven months when it was supposed to be out six months ago, and I think that's a fair thing to say, and a fair way to review. Particularly given my caveat of appreciation for the art above, but condemnation for the pace and missed expectations. Cover Art - 5: Very strong, brutal in its intensity, and symbolically representing the story at hand. I like the recurring thematic in these covers, too, of the Phantom Zone and its disembodied form. Very compelling.